UIDs. That is what they are called in the US. Unidentified Remains. The remains of a human being, a collection of bones, sometimes a whole skeleton, sometimes only bits and pieces. They collect in storage rooms, stuffed into cardboard boxes, lonely and forgotten. They are planted in pauper’s graves, sometimes cremated, sometimes misidentified as deer or bear bones and left where they lie. That is, if they are found at all. Overburdened and underfunded police and labs can’t prioritize them, and even when they try, the forms utilized by the FBI are, literally, 30-pages long. Not something a police officer asks family members to work through when reporting a missing person, so even if remains are found, finding the right name is a shot in the dark by a blind, drunken shooter. It simply doesn’t happen. Something had to be done – and Speaking In Bones tells the tale of what normal, everyday people are willing to do to find the links – to identify UIDs and return them to where they belong. The woman sitting in Temperance Brennan’s office chair plays a horrifying soundtrack. Two male voices, one female. And the female is begging, literally, for the torture to stop. Hazel “Lucky” Strike is an odd, and possibly dangerous, new being to Tempe. A “Websleuth”, one of a growing group of everyday people who spend their time and efforts researching missing persons and unidentified remains, attempting to find a match, to bring the remains home. Simplistically, they match bodies to people ‘gone missing’. And while Tempe immediately jumps in with “That is the task of law enforcement in conjunction with coroners and medical examiners” she soon must admit that the situation truly isn’t handled by any of the above. Not really. Even though NCIC (National Criminal Information Center) recently NCIC MP and UID Data, eighty percent of coroners and MEs rarely or never even try to match MPs and UIDs. The bones simply go in a box and get stuck on a shelf, forgotten once again. And while Tempe comes across quite sanctimonious and holier-than-thou at first, she soon is intrigued by Lucky’s idea. The woman thinks she has identified a UID. A UID Tempe has in a box on her own shelf. Digging further, Tempe gets another shock. At any one time, there are 90,000 missing persons in the United States. In the past fifty years, the cases of unidentified remains, most never identified at all, runs upwards of 40,000. Forty thousand human beings whose families will never know what happened to their loved ones. Tempe can’t resist a mystery, and this one crawls in and settles under her skin. And what happens becomes a horrifying story of obsession, zealotry, and twisted murder that had me alternately reading compulsively and hitting the web to research websleuthing and the people who spend their time and money trying to bring the lost home. 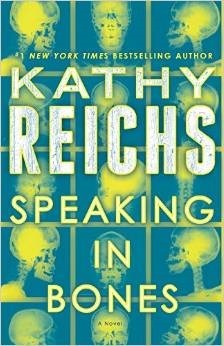 Reichs does her normal outstanding job of not only brilliant research, but bringing her writing to life, giving it personality and a life of its own. The story is gripping, her characters compelling, and her grasp of the issues ‘behind the scenes’ kept me reading well past ‘dumb o’clock’. She layers the reality of websleuthing with a shocking modern day tale of religion, obsession, murder, psychology and bigotry that left me sitting here well after I had finished the book, shocked into meditative silence as I tried to absorb all that I read. There is, of course, the issue of her relationship with Andrew Ryan, lieutenant-detective, Service des enquêtes sur les crimes contre la personne, Sûreté du Québec. In other words, a Detective Lieutenant with the Quebec Provincial Police and Tempe’s on-again-off-again lover and general pain in the backside. Things are just as volatile, and frustrating, there as they always have been. Enough said, other than to say that the roller coaster seems to be on the upswing now. Whether that will last is another question. This book bounded to my “Top Five Reads of 2015” with a bullet with shocking ease. I encourage you to read it – it truly is the best of Reichs books that I can remember reading. It isn’t perfect, but it is perfectly stunning. For further information on Websleuthing, MPs and UDIs, here are a few sites. One thing that is pointed out in the book, and was further noted during my own research, is that people are people. There are some whacko, vitriolic head cases out there posting on the sites. There are, however, many more people who are honest, caring, normal human beings who simply want to help. The following are only a few of the sites Ms. Reichs recommends in her book. It is. The pain of families who will never know what happened to their loved ones must be incredibly painful. But there are also those who are simply thrown away, like their lives mean nothing – less than trash…. I hope people take Ms. Reich’s wonderful work and turn it into something positive for all those families, all those lost bones… I am glad you enjoyed the review. I love genealogy and family search. There are some of my ancestors who were killed and buried somewhere without known grave. Lost bones. I have to read that book. It really tugged at my heart. It is brutal in a way, very real, but it blew me away. I put it on my reading list. Thank you for sharing! Got a nice note from Ms. Reichs – appears she liked my review! Blushing…..